The DSC is controlled hydraulically. 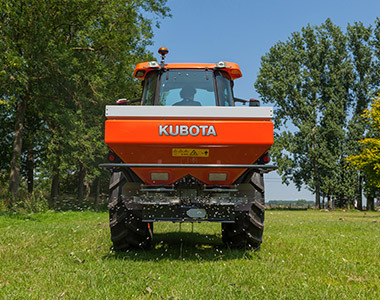 It is the most compact spreader in the range, but features all elements of the Kubota spreader range. The basic hopper capacity is 700 litres, but can be increased up to 900 or 1,400 litres with different hopper extensions. The standard working width is 9-21m. The Kubota DSC is very compact. The spreader comes with a grading box as standard, to determine the fertiliser characteristics and quality. With the RotaFlow system and 4 vanes per disc, the fertiliser is treated in a gentle way and is spread in a triangular shaped distribution pattern with double overlap. 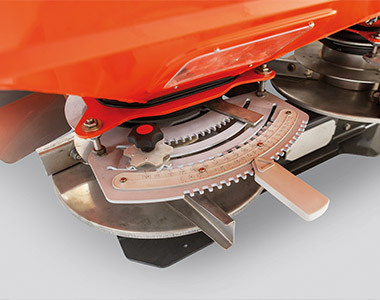 The DSC can spread up to 21 metres.